Catering to the dental needs of kids requires a special touch. 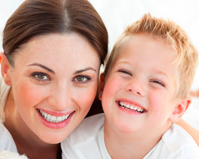 As a father of a 3-year old, Dr. C loves working with children and is great at putting them at ease. Our dental office has been designed to make kids feel comfortable and relaxed – with plenty of books, word puzzles, toys, stickers and a polaroid for them to keep! Each child who comes to Union Smiles gets a free fun "Union Smiles" sticker in recognition of their visit, the option of getting their polaroid taken with/by Dr. C which they can then take home.